Our sensors are customly designed and built to be accurate and user-friendly. 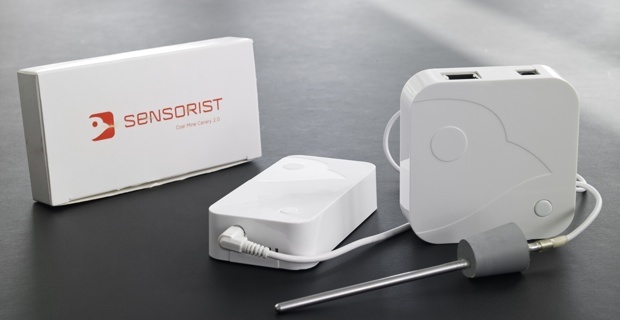 The system is modular and made up of multiple parts that connect seamlessly together - all manageable from one online Sensorist® account. 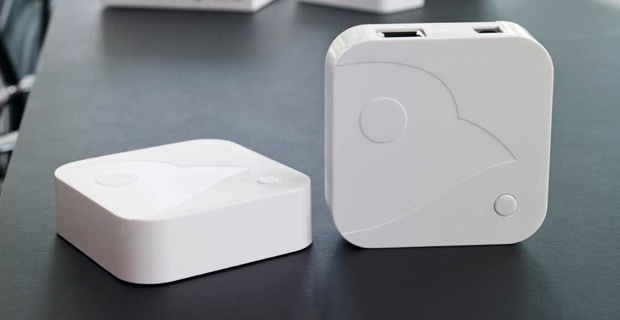 It consists of a gateway, which is connected to your Internet router, and a number of wireless sensors. Every 15 minutes the sensors transmit their measurements to the gateway. The gateway passes them on to our servers where they can be explored using our software or API. The hardware components are described below. See also our full data sheets (PDF). 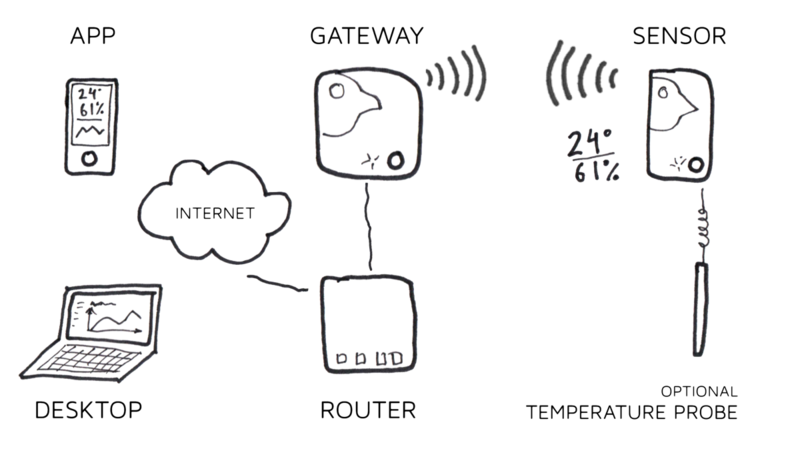 The gateway is the communicator between the sensors and the Internet. It connects to power using the supplied adapter and via Ethernet to your network for Internet access. 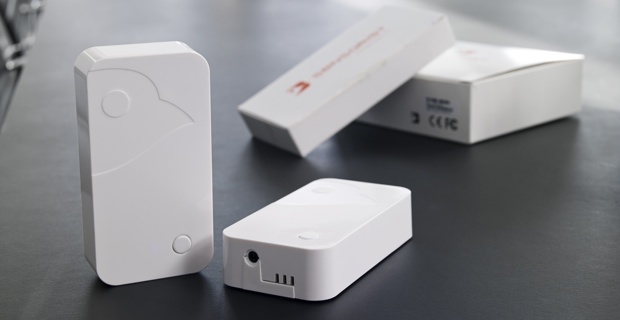 It communicates wirelessly with the sensors within 950 meters line-of-sight. It continuously sends the measurements to our servers. Dimension 80 mm x 80 mm x 25 mm. The sensors measure the temperature and relative humidity every quarter of an hour. They are wireless and run on replaceable AAA batteries (+1 year battery life). They can be placed inside or outside, as long as they don't get wet. Our sensors have the ability to have a probe connected to them through a plug at the bottom. Temperature range is from -35 °C to 60 °C and accuracy is: -10 °C to 85 °C ±0.4 °C, -40 °C to -10 °C ±0.8 °C. Humidity from 0 % to 80 % ±3 % points (pp). The sensors have great stability with a yearly temperature drift of less than 0.01 °C. This means that calibration every 10-year period is sufficient in most cases. Dimension 100 mm x 55 mm x 23 mm. We offer temperature probes in two versions. One for general use and one with a cork for mounting into wine bottles - both have a range from -30 to 65 °C. For more extreme temperatures or for connecting 3'rd party equipment we provide a PT100/PT1000 adapter. A water detection probe for detecting water. This probe returns a value from 0 - 100 % and can be used in places where flooding is a risk. Our CO₂ probe records the CO₂ level in parts per million from 0 - 2000 ppm primarily for monitoring indoor climate. A magnetic contact probe. This can provide open/closed feedback for a door or window through a two part magnetic contact. Our barometric probe records the atmospheric pressure in hPa.